While watching “The Other Boleyn Girl” – again – a couple of days ago I felt absolutely sure about a “theory” I developed a month or so ago: to me, Eric Bana should be the one getting all the good parts that end up in Brad Pitt’s hands. Not only is the man insanely handsome and charming, he can act. He can really act. And he’s versatile. I started thinking of how wonderfully he would have played Mr. O’Brien, Lt. Aldo Raine or Benjamin Button, for that matter; how much subtlety he would have brought to those characters. It’s such a shame that star power apparently always wins over talent. That makes me sad. 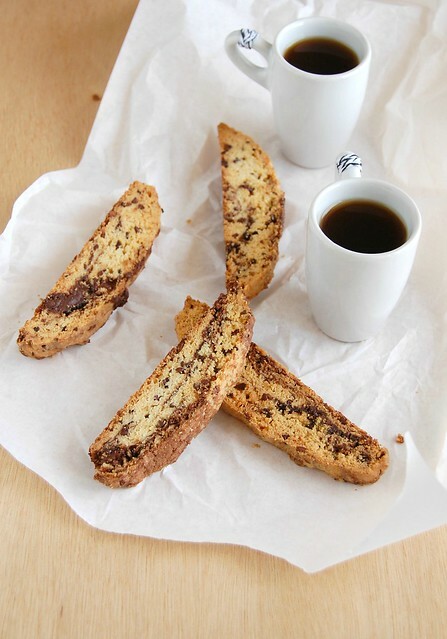 Making these biscotti was not the walk in the park the previous biscotti had been – the marbling with melted chocolate was sort of a pain in the neck. But the final product was worth every second of swearing in my kitchen: the biscotti tasted delicious and looked beautiful, too. The original recipe called for 1 cup of walnuts, so feel free to use them instead if you prefer. In the large bowl of an electric mixer, cream butter until smooth, about 1 minute. Add the sugar in a steady stream then beat for 2 minutes longer. Beat in the eggs, one at a time, scraping the bowl occasionally. Beat in the vanilla. On low speed, mix in the sifted ingredients in two additions, mixing just until incorporated. With a spatula, stir in the cacao nibs. Divide the dough in half and place half of it into a large bowl. Working one bowl at a time, drizzle spoonfuls of half the chocolate over the top of the dough, then cut through the dough with a spatula – do not overmix; you want the marble effect. Transfer the batter to the prepared sheet, shaping it into a 30x5cm (12x2in) log. Repeat the procedure with the remaining dough. Bake for 25-30 minutes or until logs are firm and their bottom is lightly browned. Remove from the oven, set over a wire rack to cool for 20-25 minutes. Reduce the oven temperature to 150°C/300°F. Line a large baking sheet with baking paper. With a serrated knife, slice the logs into 1.25cm (½in) slices. Place them onto prepared sheet then bake for 10 minutes each side or until golden. Cool completely in the pan over a wire rack. I love this biscotti, the marbling reminds me of stracciatella! I AM SO WITH YOU!!!!!!!!!! Have you seen Eric Bana in Chopper? It is a pretty graphic and violent film, but it shows you the depth and bredth of Bana's talent, he is truly a chameleon. But on the Biscotti? Looks delicious! I'm amazed at how much you know about movies and actors!! It's amazing!!!! The biscottis look amazing too!!! Sara, I'm addicted to biscotti. They're delicious! Anonymous, I have not! I haven't been able to find the movie here in Brazil, but I'll buy it on the US in September. I have seen the trailer and I can tell Bana is amazing on it.